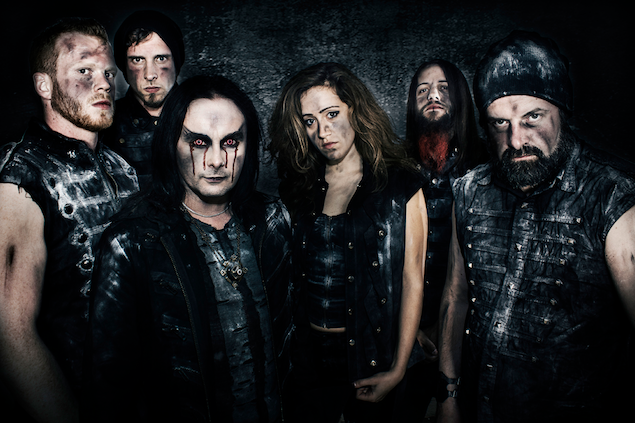 Nuclear Blast Entertainment has announced the signing of DEVILMENT, which is fronted by Dani Filth (CRADLE OF FILTH, TEMPLE OF THE BLACK MOON), with plans to release the band’s first full length The Great And Secret Show this fall. Adds Filth: "The album cover depicts an intended escape by one of Jack The Ripper's victims, (followed as she is down a moonlit Victorian alley) into another enchanted realm. Some might read it as an imagined release from the horrible pain to follow, but the artist Drake Mefestta and I thought it served to show the lure of the mystical, amid a sea of debauch. The artwork that follows in the booklet is a stunning articulate walk-through of that enchanted realm. The album is entitled The Great And Secret Show and concerns itself with the occult pulse behind the world, a land of imagination that can be slipped into at will. Like a generator buzzing behind everything. The truth behind the Wizards curtain. A phantasmagorical nightscape. A wonderland. A midnight playground. The fertile land of the dead." The Great And Secret Show was recorded at Grindstone Studios in Suffolk with producer Scott Atkins, who has previously worked with the likes of CRADLE OF FILTH, BEHEMOTH, AMON AMARTH, SYLOSIS and GAMA BOMB. The artwork was created by Drake Mefestta. The band consists of Dani Filth (vocals), Daniel Finch (guitar & samples) Colin Parks (rhythm guitar/lead guitar), Nick Johnson (bass guitar), Aaron Boast (drums), Lauren Francis (keyboards & vocals).